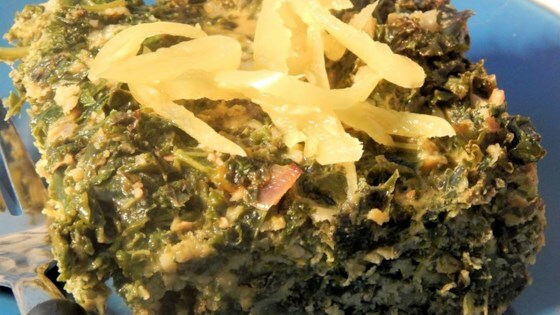 "Kale can be tough to work with as it's generally bitter, but this recipe makes it tasty! Versatile, this dish can be served as a savory breakfast dish or main dish at dinner. This recipe was adapted from Regina Schrambling's Collard Squares." Heat 1 tablespoon olive oil over medium-high heat in large heavy skillet. Add red onion; cook and stir 3 minutes. Add garlic; cook and stir 2 minutes. Add kale and continue to stir until kale is wilted, about 5 minutes. Place kale mixture in a large bowl. Gently toss kale with tamari sauce, Romano cheese, whole wheat bread crumbs, eggs, oregano, sea salt, and black pepper until well combined. Lightly coat an 8x8-inch baking pan with 2 teaspoons olive oil; pour in egg and kale mixture. Distribute chopped pickled picante peppers on top. Bake in the preheated oven until eggs are well set and the top is lightly browned, 20 to 25 minutes. Cut into squares to serve. See how to make baked chicken thighs with a sweet, hot mustard glaze.